I usually don't like to get to personal but I think this is a topic that affects many of us; especially women. By now everyone knows I am an ex-beauty queen turned bodybuilder. However, what most of you don't know is my struggle with weight. I didn't suffer from an eating disorder sort to say but I did do everything possible to look and feel a certain way. I may not have purged my food but I did try every diet known to me; including one of only eating Tilapia and Asparagus for 6 meals a day, 7 days a week for 3 months straight. Not sure which is worse to be honest. I was depriving myself from so many nutrients that my body was showing it and I couldn't tell. I looked tired, felt weak and had lost my "glow". The Tilapia and Avocado was only the beginning. Fast forward to 3 years later and I was still struggling with looking a certain way for my NPC Bikini Competitions. I had hired coaches, who were supposed to be the best in the biz, but only mad matters worse. When I wasn't losing the weight they lowered my calories more and added in more cardio. There was even a point that I had cardio for 3 hours a day?!?!!!! Needless to say, I got last place on that day because my body stopped responding. If this sounds familiar, then you may be experiencing Metabolic Suppression or better known as Metabolic Damage. However, he word damage gets thrown around a lot but its not the correct term to use. Those that really have a damaged metabolism are the ones suffering from a Thyroid insufficiency and should seek medical help A.S.A.P. Sometimes we may think we are dealing with a suppressed metabolism but there are some conditions you need to have in order to really be experiencing suppression. The reason that the metabolism adapts is because of survival mode. We can train the body to not need a lot of calories in order to survive. This is why if you've dieted for more than a year you can start to see the affects of this. Is there a way to fix a suppressed metabolism? If so, how? 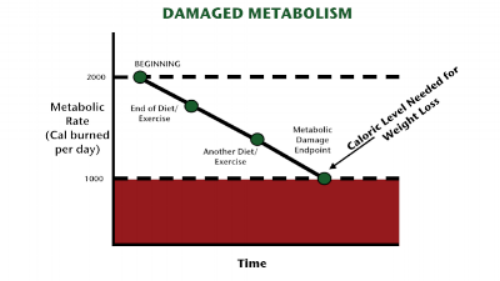 Yes you can fix it, which is why the term "Metabolic Damage" does not fit here because it can be restored. The way to fix it is by reverse dieting. Reverse Dieting is exactly as the name suggests...the reverse of dieting. What do you do when you diet? Decrease calories slowly. In Reverse Diet you increase the calories slowly. Please be aware that just like when you diet your body fat and weight go down because of the deficit, they will increase during reverse dieting because of the surplus. How long will it take to restore? About as long as it took to adapt. Since I was many years dieting, I still haven't fully restored mine but its getting there. I would say about an 85%. If you have any more questions on this topic, please don't hesitate to send me an email.